Last weekend we took advantage of a sunny Sunday, fired up the Mini Cooper, cranked up the Springsteen, and headed up the Taconic. After a quick stop to load up on some Seyval Blanc at Clinton Vineyards and some roadie victuals from the Wild Hive Cafe, it was off to Hudson. The foodie grapevine has been all abuzz for some time about two Hudson destinations on Warren Street – Mexican Radio, and American Glory BBQ. Last Sunday we were hankering for some Q. We arrived in Hudson just in time for their Gay Pride Festival, which I suppose would have been even more festive if they had scheduled it one week later. The restaurant was located a few blocks down from the celebrations, but still had a full bar and busy dining room. We settled in to two seats at the bar, and perused the menu. You can peruse the menu yourself right here. The offerings included the holy trinity of BBQ – ribs, brisket, and pulled pork, but also a good selection of non-Q items – grilled steaks, gumbo, vegetarian platters, and rotisserie chicken. I was there for the BBQ – and was gratified to see all of the old standards available in combination platters. The kitchen prepares two cuts of ribs. A St. Louis style refers to the cut – not the sauce. The breastbone cartilage that runs across the top of the rack is removed. A full pork spare rib is also available. The meats are prepared “Memphis Style” – with a nicely spiced dry rub, served “nekked”, with sauce on the side. A rack of squeeze bottles of homemade sauces are served with your Q, and cover all of the regional variations on that theme – from Carolina style vinegar based sauce to a St Louis sweet tomato based version. I personally like my ribs just the way they come out of the smoker. A well made rub and the right amount of smoke is all the flavor I need. These had both, and they were great. The real surprise on my combination plate was a Tallahassee smoked turkey leg. The menu described it as “mammoth”. I can only say that who ever butchered this turkey is a better man than I. I did see a turkey leg this big once before – at the Renaissance Festival in Sterling Forest, but there it also had to double as a weapon. It was also delicious. It was impossibly tender, moist, flavorful and somehow still had a wonderful crispy skin. The pit-master here takes “low and slow” to places that I have not been before. The ribs were perfectly cooked – a toothsome texture just shy of “fall off the bone” – something very hard to master. The side dishes were reason enough to show up. We sampled the mac and cheese, and the red beans- a spicy garlic red sauce that was just perfect with this dish. Hidden away under our pile of ribs and slices of smoked brisket was a mound of the kitchen’s version of Texas hash – chopped brisket in a tangy BBQ sauce. All of this, with some corn bread on the side, was $41 for two people. Where else can the results of ten hours of labor be had for $20.50 per person? 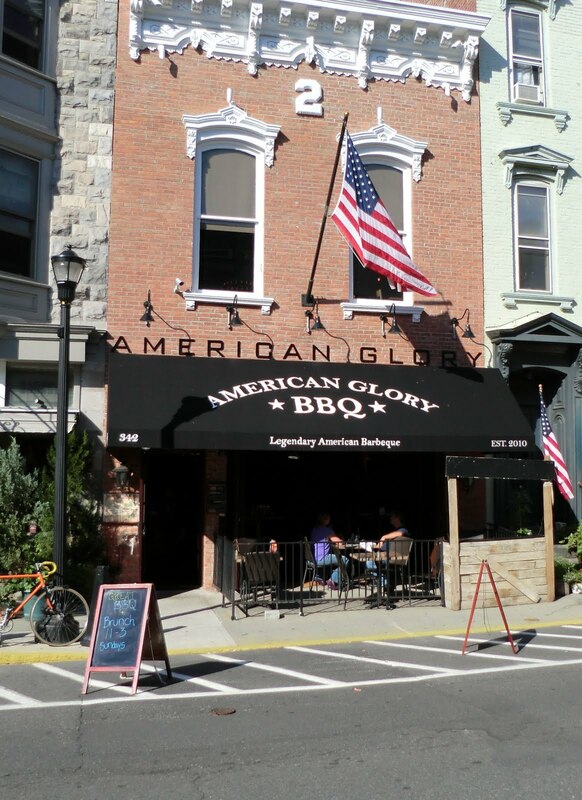 American Glory BBQ is serving some of the best Q that I’ve tasted outside of St. Louis in a wonderful setting complete with a great bar, outdoor sidewalk seating for the summer, and a great selection of locally brewed beers. What’s not to like?